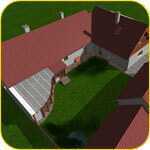 Original farm house with barns is situated in the second zone of houses behind a village green. Original family house newly named “Under the Arches“ is reconstructed in a low budget handmade and personal way. On the contrary, reconversion of the barn to “The Natural house“ should be a demonstration house of natural building techniques of building in a modern, simple and precise style. Both buildings will use alternative sources of energy – wood chip central heating, wood fueled Finnish mass oven, solar collectors, PV panels, passive solar gain, etc. There are no structural changes to the present house “Under the Arches“. Only the disposition is partly changed – especially in the bathroom area with a composting toilet and a sauna, there is a new technical room a central wood chip heating, there is added a sheltered entrance as well as a conservatory with the use of natural round wooden logs. 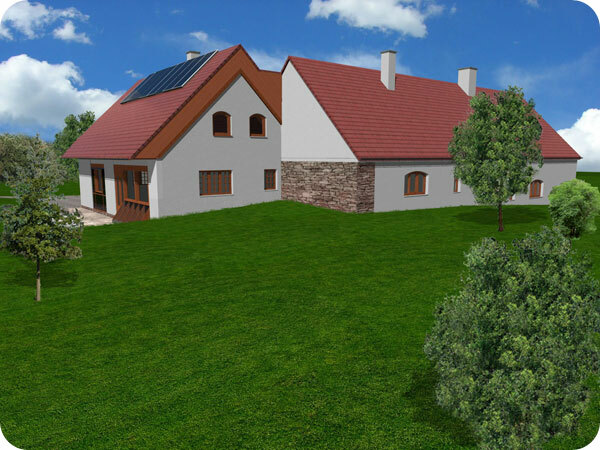 The house can be used for family living, but will be used also for hobby activities for youth and small courses of Permaculture, natural building etc. 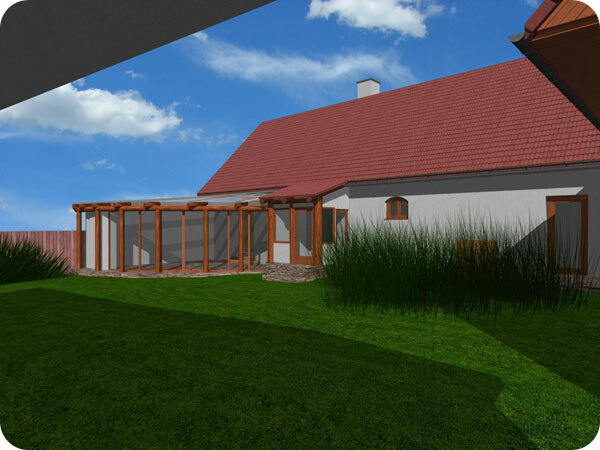 The original barn with stone pillars and wooden ceiling and roof construction will be remade into a new entity – by internal furnishing and wrapping from the outside into natural insulations – into “The Natural house“ for family living. Broad-minded space of the ground floor will be heated by a round Finnish oven around which is a spiral staircase leading to the under-roof space with bedrooms. 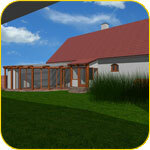 Basic insulation of the stone pillars will be strawbales, only from the South reed mats will be used. South side will be among the pillars partly glass and partly Trombe wall. 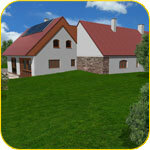 Strawbales will be used also to insulate the roof construction. The intention is to cover the south side of the roof as much as possible by solar panels and collectors, the heat gained will be distributed through integrated floor and wall heating. 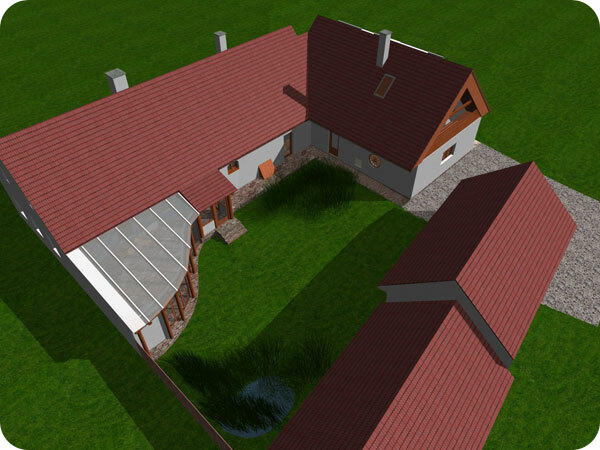 “The Natural House“ is unique due to the fact, that it is the first time a building permit has been obtained for building a typical strawbale house in the Czech Republic. 3 cm of earth plaster ensures 90 minutes of minimum fire resistance. 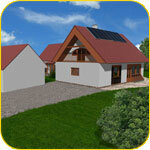 This projects is being built with minimum finances, but with immense personal input of the client. 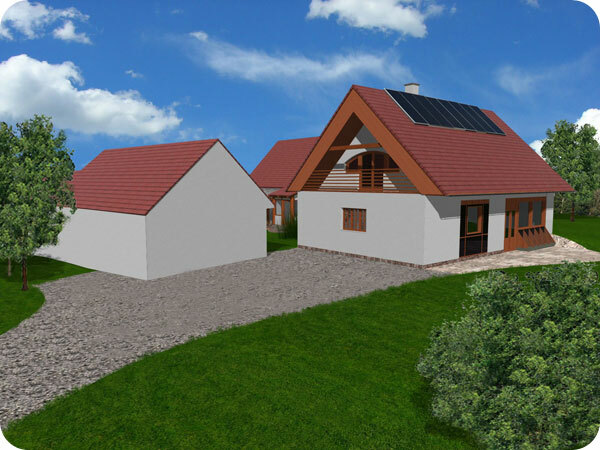 The client – members of Civic association PermaLot – are dedicated to supporting economic alternatives in the region of Bouzov, natural building, alternative energies, waste disposal, educational activities, but also creating an eco village. For additional and current information you can look at www.permalot.org.